Paul W. Stewart, founder of the Black American West Museum, grew up in Iowa playing cowboys and Indians with his friends who always made him play an Indian. They assured him that there were no black cowboys and thus he had to play the role of the Indian. As an adult living in Denver, Stewart discovered this was not true and began a lifetime search for stories, photographs, clothing, memorabilia, and papers to document the existence of black cowboys in the West. Stewart’s passion led him beyond cowboys and he accumulated an extensive collection related to black Western pioneers that he wanted to share with others. In 1971, the collection served as the nucleus of a small museum that opened in the basement of Denver’s Clayton College. In 1983, when community leaders learned that a developer planned to raze the Dr. Justina Ford House, they requested a delay to allow them to find funds and a location for its removal. The developer complied and Historic Denver, Inc., a private non-profit group, gave preservation funds to move the home in 1984 to its current California Street location in Five Points. Under the supervision of a newly-formed Board of Trustees, the home was restored and opened to the public in 1988 with Stewart as its curator. 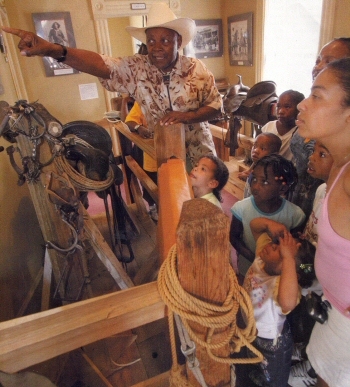 The exhibits included Dr. Ford’s examining room on the main floor, and a black homesteader’s room, a farming and ranching room, and, of course, a room honoring black cowboys of the early West on the second level. Today, thanks to Stewart and community-wide involvement, the museum has become well known as a destination point for visitors from around the world for its photographs, artifacts, and historic documentation on African Americans in the West. Writer’s conversations with Paul W. Stewart and documentation from the Black American West Museum’s Director, La Wanna Larson.